What more glorious institution does England have to offer than that of afternoon tea? Introduced by the Duchess of Bedford in the mid-19th century, afternoon tea has firmly lodged itself in our culture and in our hearts. The seemingly endless wait between lunch and dinner was just too much for Anna, the 7th Duchess of Bedford, prompting to her to introduce the now obligatory 4 o’clock tray laden with tea, cake and bread and butter into her daily routine. Friends soon began to follow suit, and thus an institution was born. But in this day and age, is a pot of tea and a limp cucumber sandwich enough? Not for Kris Biggs, Head Pastry Chef at our Michelin-starred kitchen. 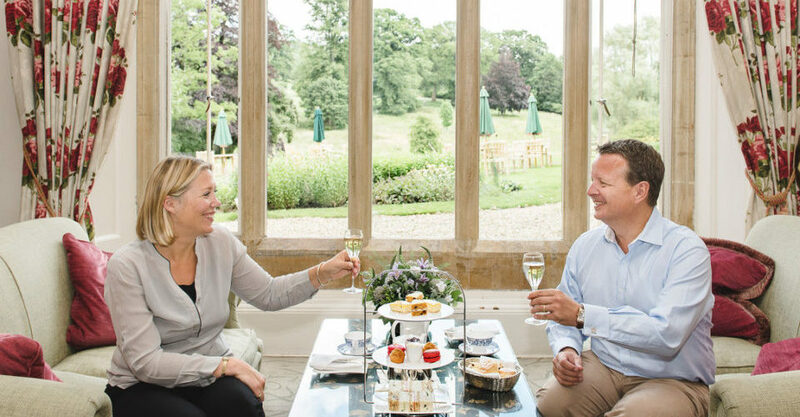 We asked him a few questions about what makes the ideal afternoon tea and how he has gone about constructing his exquisite Cheltenham afternoon tea menu. Scones are obviously integral to a proper afternoon tea, who first taught you the art of scone making? My Nan. After years watching eagerly, she finally showed me how to make them her way. I always remember making ‘rock buns’ first, remember them? Do you have a secret ingredient or tip for making the perfect scone? Clearly you’re no stranger to crafting the perfect afternoon treat, any particular favourite? That would be our modern take on strawberries & cream. The dish consists of a vanilla bavarois with a strawberry set jam in the centre, which is then coated with a strawberry glaze and sat atop a shortbread biscuit. It takes me over two days to make and assemble all the layers. What’s your favourite type of tea (e.g. Earl Grey, English Breakfast)? Having been brought up on English breakfast tea, I’m very traditional when it comes to afternoon tea. I do like a good espresso though. If you could only choose one cake to accompany your afternoon tea, what would it be? Fruit cake! I love a good fruit cake. It’s got to be jammed packed with fruit though, and brushed with plenty of brandy so it’s nice and moist. It’s got to have nice thin layers of marzipan and fondant icing too! At Lords you serve afternoon tea on tiered cake stands – Sandwiches on the bottom, then scones, then cakes. Would you start at the bottom or the top? I prefer to start with the sandwiches at the bottom, then the scones and finish with the dessert. I always leave my smoked salmon to the end though, as I always find I need that savoury hit to finish things off. What makes Lords’ afternoon tea stand out from the rest? When I design a menu I always take into consideration our guests and the feel of the surroundings so I can judge what is best for them. I believe that our afternoon tea at Lords is a modern take on classics, but not too modern! Each element has a unique flavour and style without departing too heavily from the traditional template. What is your personal favourite spot in the hotel to take afternoon tea? I love the front garden on a summer’s day, which is really beautiful, but I really like the library as well because it has a lovely homely feel to it. If all of that talk of scones has got you in the mood for your own taste of Kris’s perfect Cotswold afternoon tea, give us a call on 01451 820243 to book!